Logic announced that Fabian Harris and Willoughby Harvey are the winners of the Refer a Friend Promotion. The promotion, which ran from January 1st to 31st March, 2013, required having an existing Logic customer refer a friend to Logic and have them sign up for a service. Once completed, the duo each received a $25 credit and became eligible to win an ipad mini. Contestants could sign up online at Logic’s website or in person at Logic’s Victoria Street location. It was Mr. Harris who later referred Mr. Harvey to Logic and subsequently their voucher was drawn as the grand prize winner. 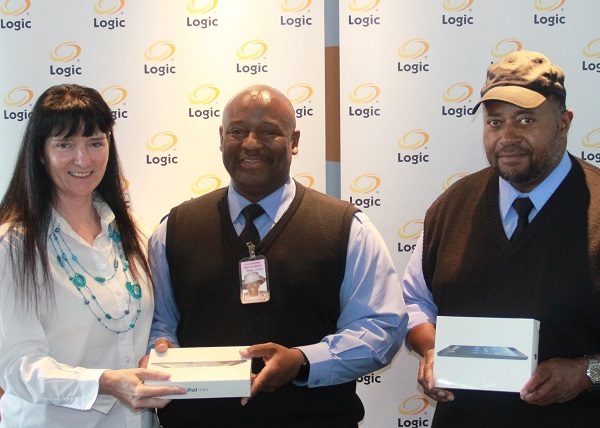 Mr. Harris had this to say about receiving the prize, “I’ve been with Logic since the beginning and they’ve always provided me with great service so I felt comfortable referring my friend to Logic. And also this way, both my friend and I had a chance of winning one of those new ipads everyone raves about”. poor guy on the right… he looks like he was pushed to the side. she should be in the middle. anyhow congrats gents. the ipad mini is very nice.